Anyone who looks at Laurie Lufkin’s Facebook page will notice a few consistencies: Laurie is a successful competitive cook, she is the mom of a sweet daughter who is also a great cook, and from the beautiful photos she posts, Laurie loves the area of the country where she lives – New England. I was thrilled when Laurie sent me this beautiful cookbook with recipes from the place she loves. 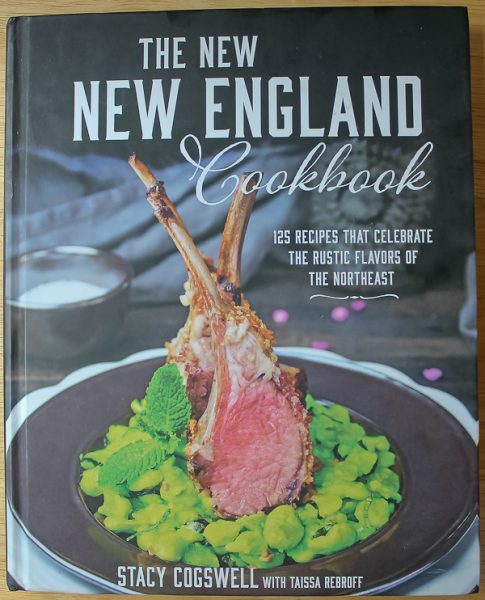 I love cookbooks that have chapters separated by seasons, allowing the reader to learn what is seasonal, available locally in that particular area, and even traditions and popular recipes. I know chowders are popular in New England, and being from the Midwest I could hardly pass up a corn chowder. 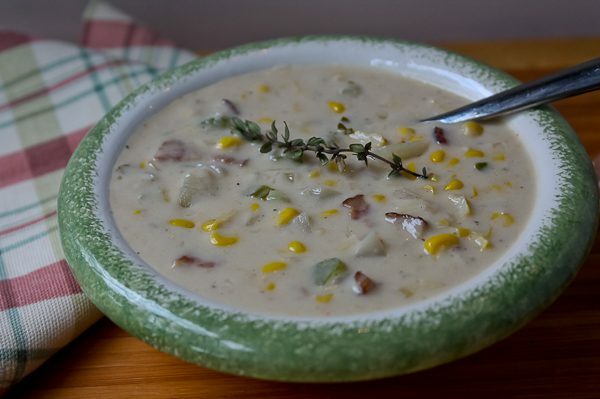 I learned something new from this corn chowder recipe, and I love learning new cooking ideas. Why I have never done this before being from corn country I will never know. I have made many kinds of soup stocks over the years and frozen them to have over the winter. But corn cob stock? Why have I never done something so obvious? Well, now I am sold and already have made another batch which is tucked away snuggly in my freezer out in the garage just waiting for a Chicago blizzard in a few months. 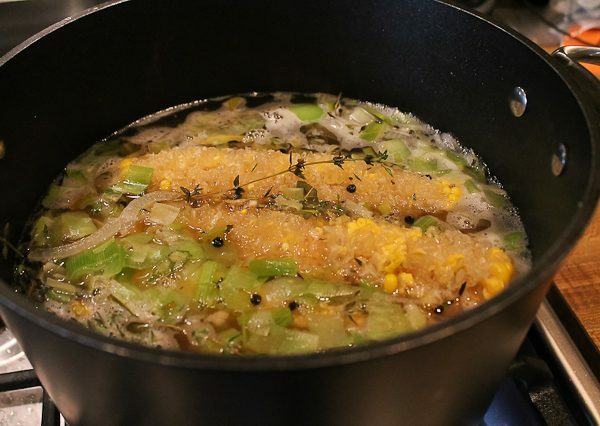 After scraping the corn off six ears of corn, the cobs are placed in a large kettle along with onions, leeks, fresh thyme sprigs, bay leaves, and peppercorns. It’s all covered with water and simmered for a couple hours. Four cups of the stock will be used for what is one of the best corn chowders I have ever had. 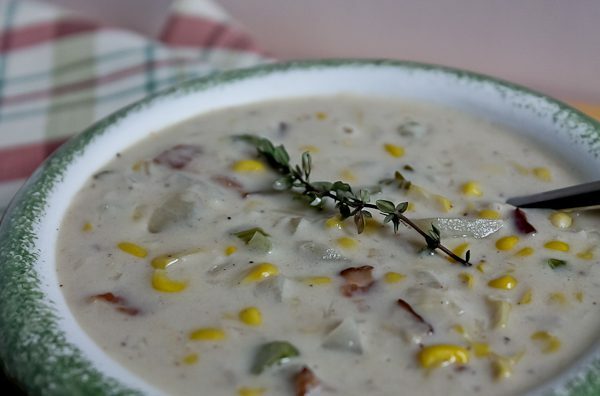 The chowder has bacon, potatoes, celery, lots of cream and butter, and seasonings of thyme, Old Bay, and Tabasco. Don’t let all the cream throw you off. The recipe makes a lot and you could serve a crowd with this. It’s rich, satisfying, and absolutely out of this world. It also called for a marinated tomato topping but I didn’t have those ingredients on hand, but I’ll include it here. I’m sure it’s wonderful, but the chowder was amazing on its own too. Thank you, Laurie, for this beautiful cookbook that introduced me to corn stock! I’ll never be the same again in my soup stock preparations for winter. In a large soup pot, cook the bacon over medium heat until the fat is rendered out. Add the onions, celery, and corn; cook for 10 minutes. Add the butter and flour and continue cooking for 10 minutes, and while stirring, add the stock and cream. Add the seasonings, potatoes, and Tabasco. Cook until the potatoes are tender, about 10 more minutes. Garnish with the marinated tomatoes. Once cooled, the chowder can be stored in an airtight container and refrigerated up to 3 days. The recipe can also be made gluten free by omitting the flour, but it won't be as thick. For Corn Stock: In a stock pot, sweat out 1 sliced onion and 4 sliced leeks for 6 minutes. Add 6 shucked and scraped corn cobs, ¼ ounce of fresh thyme sprigs, 2 bay leaves, and 2 Tablespoons peppercorns. Add water to cover. Bring to a boil, then simmer for 2 hours. Strain the stock, discarding solids. Four cups will be used for the soup, the rest can be frozen for a later use, up to 2 months. For marinated tomato topping: In a bowl, combine 1 pint cherry tomatoes, halved; 2 Tablespoons finely diced shallots, 2 Tablespoons basil chiffonade, ¼ cup sherry vinegar, 1-1/2 cups olive oil, 1 Tablespoon salt, and 1 teaspoon pepper. Allow to marinate at least 20 minutes before serving. Can be stored in refrigerator for 2-3 days. One Response to Super Mom, Super Cook!